Your seventh anniversary is a special occasion which signifies trust and faithfulness in your relationship. Celebrate this memorable day with a beautiful arrangement of fresh cut flowers for your seventh anniversary! Your selection of seventh anniversary flowers should reflect the love and trust of your relationship. Sending your loved one a lovely bouquet of freesia is sure to make that wonderful day even more amazing! 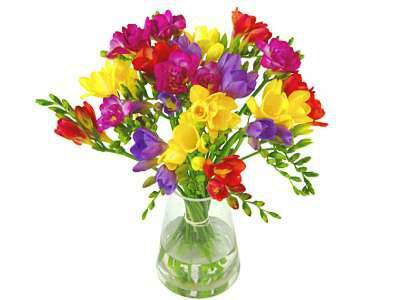 Freesia is a beautiful and fragrant flowers which represents everything about the bond between you and your loved one. Freesia is symbolic of trust and faithfulness. Freesia is a reminder of love and fidelity through all the seasons. Its long lasting scent is a constant reminder of your love, friendship and commitment. The blooms of this flower are elegant and delicate, while the stems are sturdy and durable.This is the prefect representation of the strength and beauty of your relationship. Show her how powerful your love has grown for her and how long lasting it is this anniversary by sending a fresh and fragrant bouquet of freesia. This magnificent flower is native to the Cape of Good Hope in South Africa. Surprisingly, before the 1950’s the freesia flower had not made it’s way over to the western world. Since then it has gained enormous popularity worldwide. It is now one of the most sought out flowers because of its strong, sweet floral scent and small delicate blooms. The colors of the flower bloom in white, golden yellow, orange, red, pink, purple, lavender, mauve and bi-colors with a colored throat. The freesia flower was named after German botanist Friedrich Heinrich Theodor Freese. Let Avas Flowers help your celebration of such a momentous occasion with a terrific selection of 7th Anniversary Flowers. Send her a charming and fragrant bouquet to celebrate seven unforgettable years together.